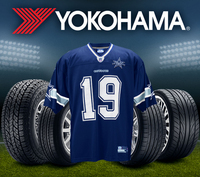 Now through November 6, 2011, Yokohama is teaming up with the Dallas Cowboys to offer a free Official Cowboys Replica team jersey with the purchase of a set of four Yokohama tires. Not only will you be able to sport the industry's best performing tires, you'll also be able to sport a great Cowboys jersey - absolutely free (an $80 value). Just in case you needed a little more incentive, Yokohama announced an 8% price increase effective November 1, 2011. Even with the price increase, Yokohama still outperforms the competition with it's technology driven tires, combining outstanding handling and longevity at a mid-range price.